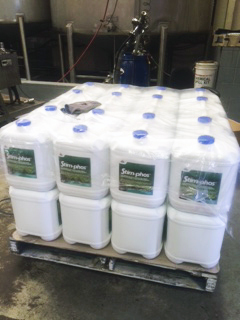 Brand new batch of STIM-PHOS heading out the door for our turf customer – Living Turf. On the back of the huge success of STIMPLEX and its use with Phos acid, OCP have decided to combine the biostimulant benefits of the two with the introduction of STIM-PHOS. We are very excited by the prospects of this product with the added benefit of Chitosan, as all three ingredients are known for their positive effects on plant health and we are confident that STIM-PHOS will assists growers with keeping their crops in tip-top condition.